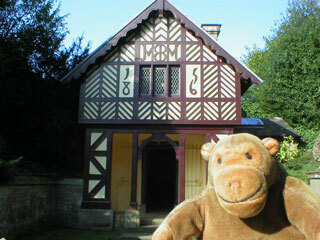 "It's not what you'd expect the back of an Egyptian temple to look like"
Dodging the ape, Mr Monkey found that, while he'd gone into an Egyptian temple, he'd come out of a half timbered Cheshire Cottage. It's not a real half timbered cottage; but, then, it's probably not a real Egyptian temple, either. 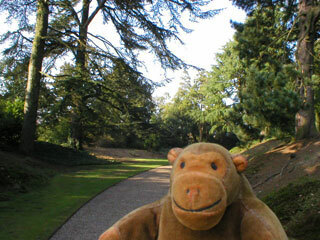 Mr Monkey didn't worry about what might be what, and went to frolic in the pines instead.